Several times throughout our interview, 27-year-old Ho Lee Ching described herself as “timid”. But I saw her in a totally different light. She is one of the bravest women that I have ever met in my life. Ho suffers from Tourette Syndrome (TS), a neurological disorder characterised by repetitive, stereotyped, involuntary movements and vocalisations, called tics. She is also diagnosed with obsessive compulsive disorder (OCD), and anxiety disorder. Despite all this, she has not allowed her condition to stop her from pursuing her dreams, and living life to the fullest. Growing up with TS and her various disorders was not an easy thing. “As a child, I was making sounds, and I was always jerking,” she said. When she was eight, her parents finally understood that the behaviour she had been displaying was not a ‘prank’. She was taken to a doctor, and finally diagnosed. “My teachers and parents felt bad for punishing me,” she remembers. However, being diagnosed with several disorders did not make her journey less easy. “Some people still misunderstood me,” she recalls. They included some of her classmates, who were so cruel as to imitate her tics. Some teachers even refused to teach her class because of her syndrome. “I was angry with the world and everyone around me [then],” Ho says. “Whenever my birthday came round, I would wish for the syndrome to disappear. Because of her condition, Ho is unable to perform some activities that most of us take for granted. For instance, she cannot watch a film in the cinema, because she is unable to stop herself from making noises that will disrupt other patrons and force her to leave the hall. But with time, she learnt to cope with her syndrome and made the best out of the situation. “I cannot continue living my life in anger,” she says. When she was about 17 and waiting for her SPM results, Ho took up acting classes under the guidance of wellknown theatre director Joe Hasham. She loved the experience. Strangely enough, she discovered that whenever she was on stage playing a role, she could control her involuntary movements. She was not experiencing any of the jerking moments, or making those strange noises that have plagued her life. “When I do theatre, I feel very normal,” she says. Ho cannot give any rational explanation how she is able to control her tics on stage. “That is the magic of theatre,” she says. After her SPM, Ho went on to graduate with a degree in mass communication, and even became a sports writer for a website for a while. But ultimately, she returned to her first love – theatre. Currently, she is an actor in residence and facilitor at The Actors Studio. She has appeared in Thuderstorm, Dator Seri, The Taste of Water, Aku Nak Jaid Bintang, Three Doors, and Zak Zebra’s African Safari Musical, which toured to South Korea. 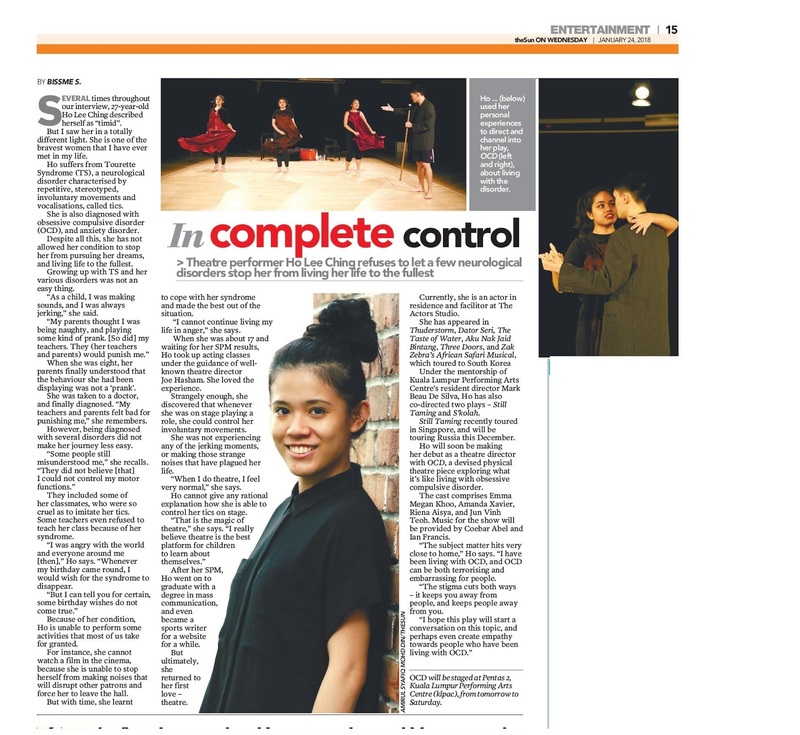 Under the mentorship of Kuala Lumpur Performing Arts Centre’s resident director Mark Beau De Silva, Ho has also co-directed two plays – Still Taming and S’kolah. Still Taming recently toured in Singapore, and will be touring Russia this December. Ho will soon be making her debut as a theatre director with OCD, a devised physical theatre piece exploring what it’s like living with obsessive compulsive disorder. The cast comprises Emma Megan Khoo, Amanda Xavier, Riena Aisya, and Jun Vinh Teoh. Music for the show will be provided by Coebar Abel and Ian Francis. “The subject matter hits very close to home,” Ho says. “I have been living with OCD, and OCD can be both terrorising and embarrassing for people. The stigma cuts both ways – it keeps you away from people, and keeps people away from you. Footnote: OCD will be staged at Pentas 2, Kuala Lumpur Performing Arts Centre (klpac), from tomorrow to Saturday.